HomeBlogSpiritualityWhat is Our Christian Witness? In the post “They’ll know we are Christians by our love” we talked about the importance of our Christian witness. This is best accomplished by our love and our unity. Unfortunately, the world rarely sees our love and unity. Instead we model hate and disagreement. That’s what the world sees and often what they think of when they hear the word Christian. As a result, we tarnish our witness for Jesus. Instead we focus on our theology, our politics, and our opposition to what we deem as evil. And in our inability to get along, we segregate ourselves into divisive denominations. But these items are not the foundation of our Christian witness. To our discredit these are the foundation of our undoing as Christians, losing sight of what it means to follow Jesus and be his disciple. Is Our Theology Our Witness? In the last several hundred years, Christians have debated, argued, and even fought over theology. Yes, in the name of pursuing a right theology, we have even killed one another. And toward what end? The result of pursuing a right theology has fractured the church of Jesus, resulting in 42,000 denominations, which is a powerful confirmation of our inability to get along. Our Christian theology is an ineffective witness to the world in search of answers. Is Our Politics Our Witness? Another area where Christianity emerges is in the political arena. We support candidates who we believe hold to a Christian worldview, espousing a biblically ethical mindset. And we oppose the other candidate, who we view as the antithesis to all that is right and godly. Yet Christians end up sitting on opposite sides of the political table: some champion one candidate, while others support the opponent. We’re missing the point. Arguing about politics will never point people to Jesus. Is Our Opposition Our Witness? Much of Christianity, especially the evangelicals and fundamentalists, take stands to oppose what they feel is wrong in the world. Two areas emerged in recent decades: opposing homosexuality and opposing abortion. To make the point, well-meaning, but misguided, Christians loudly take a stand, spewing invective to anyone who listens. We come across as hate filled bigots and not the loving followers of Jesus that he desires. Instead of talking about what we’re against, we should talk about Jesus, his love, and his power to save and to heal. Is Our Denomination Our Witness? As Christians argued and fought, we’ve divided ourselves over a minutia of details, most irrelevant and others perhaps with a bit of substance, but little that amounts to a faith-jeopardizing heresy. What’s our reaction to this? Instead of promoting Christian unity and trying to get along, we turn our backs to one another, stomp off in anger, and make a new denomination. Let’s sweep aside our theology—yes, I did say that—and our politics and our opposition and our denominations. When it comes to Jesus and his kingdom, these things don’t matter. What matters most is that we love one another and work to get along. 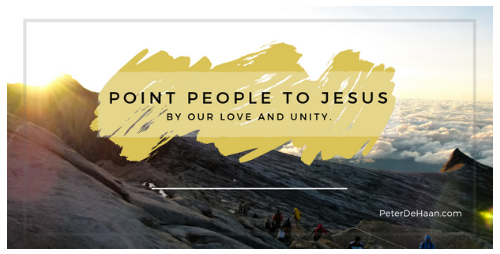 Our love and our unity form our best Christian witness. Everything else just gets in the way and tarnishes the name of Jesus.